So, we're trying to find ways to branch out now that our Disney passes are coming to an end. On Ben's day off (Wednesday), we tried out a state park about a half hour away from where we lived. It's called Wekiwa Springs, and it was really neat! It's just a natural spring that they have more or less turned into a big swimming pool. It was just a tad too cool for Jacy and my liking, so we watched Dax and Ben from the shore. They had a great time swimming in it. Dax drank about half of the water, and we're praying he doesn't get giardia. We'll go back when it's unbearably hot, and then I'll have to get into the water. Fortunately, there aren't any gators at this place, at least that's what Ben is trying to get me to believe. 1. I'm an early riser. I often wake up at 5am or before to work and work out. 4. I love cake. I love cupcakes. I love gross, disgusting, dyed shortening frosting on the bakery cakes at the grocery store. 5. I love cute pajamas. I spend way too much money on keeping my kids cute when they go to sleep. It comes, I suppose, from not having them and always wanting them when I was growing up. 6. I love warm weather. I used to think that Utah was the place for me. Not anymore. Now that I have experienced a full year of warm weather, I am officially "breaking up" with Utah for forever. Don't worry, we'll still be friends. 7. I love watching my kids figure things out on their own, and I am amazed at what they comprehend without my assistance. 8. I love my hair blonde. I've been dark brown, and I've been highlighted, and I know it's the current trend to go dark, but I gotta tell ya, I love being blonde. It's a terrible thing cause it's so darn expensive for us wannabes, but in my case, I really do have more "fun" as a blonde. It's official. 9. I love silence. I hate background noise. I'm learning, with the help of my new manual for life "A New Earth," how to shut off the noise in my head, so that I can experience REAL silence. 10. I love feeling alive. I love feeling aliveness in other people. It really levels the playing field. I've compared myself to other people my whole life, and I'm finally letting go of that, and it feels great! Okay, well, now you have my "top 10" tag. You know more about me then you ever wanted to know. Now I can sleep at night knowing that I've been "tagged," even if it was by myself! :) hee hee! Well, life has been a little crazy around here. Daxton has always been a "vomit king" since the day he was born. He is famous for his projectile spews, which occur spontaneously while eating meals at restaurants, after he gets any kind of an injury, or my favorite, everytime I try to leave him in nursery by himself. So, we've been dealing with this for a while, but lately it has increased in frequency to the point where he is throwing up after everything he eats. Soooo, the doctor and I felt that it was time to be a little more aggressive in finding out what exactly is going on with him. Our first step was a visit to the allergist. Ben was gracious enough to take Daxton to his appointment last Thursday so that I could stay home with Jacy and not have to deal with Dax's reaction when they poked his back 30 times with fluid-soaked needles to find out what he is allergic to. In the end, it didn't turn out to tell us much more than we already knew, but at least we know what it's NOT. He turned out to be pretty severely allergic to cashews, pistachios, cats, and dogs. Phew.....no pets for us! So, that rules out an allergy to milk, wheat, or eggs that we were guessing may have been the problem. 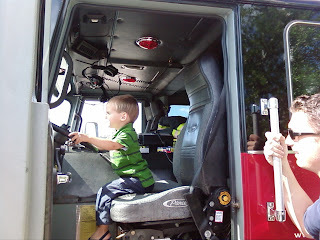 After the testing was finished, Ben stopped by the fire station near our house to see if there was any chance of letting Daxton look at the trucks. 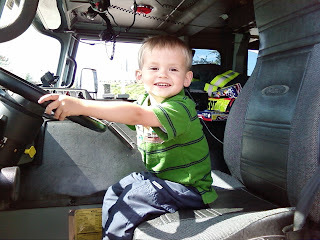 They were extremely friendly and gave Dax and Ben a tour, and Dax got to sit in the truck, so I think his trauma at the allergist's office was soon forgotten. Anyway, on May 8th, we're going to the hospital for a "barium swallow" test, whatver that entails. I know Dax isn't going to like it, and neither am I. Hopefully though, it will tell us something that can help us to treat him, cause I sure hate vomit. A Full Day at D.W. It was Ben's day off yesterday, and we're trying to make the most of our annual Disney World passes before they expire on May the 4th, so we headed off to the big D.W. yesterday morning. It was ridiculously crowded, but the weather was nice, and we wern't really in that big of a hurry to do a lot of things. We got a couple of fast passes to our favorite rides, and then we did a bunch of the less popluar "boring" rides that we've never done before. We had a great time! Jacy cracks me up! She would take intermittent "power" naps when she absolutely HAD to, but other than that, she was as wide-eyed as ever, just trying to take it all in. At four months of age, Daxton would have been an absolute nightmare to take to a place like Disney World. He HATES overstimulation even to this day, and he always freaked out when we took him to places that were loud and "in-your-face" (still does in fact). Sooo, I have a feeling that Jacy is going to be quite a "party lover!" She's going to get along GREAT with Nana! Time to join the ranks! Well, I am officially joining the ranks of the thousands of parents who have entered the "potty-training" phase of parenthood. Daxton is now sporting his Thomas the Train "big-boy" underpants and trying to get the hang of this whole "toilet" thing. The first hurdle I realized I would need to get through was to try and convince him that there was some incentive or reason why he should want to go to the bathroom in the toilet and wear "big-boy" underpants. Hence, the Elmo demonstration. Daxton has had these two Elmo dolls on his bed since we moved here, and the other day he was commenting on the fact that the baby doll wore a diaper. I jumped at this opportunity to make some headway with him, and I quickly started to point out that the baby Elmo wore a diaper, and the big-boy Elmo did not. To make the example complete, we outfitted the big-boy Elmo with a pair of Daxton's big-boy underpants. I guess it really clicked, because now every time that Dax uses the potty or tells me that he needs to use the potty (which is rare), he loves to point out that he's a "big-boy" now. I don't mean to boast, but I was quite satisfied with myself for getting through to his 2-year-old mind that it was cool to be a "big boy." Today, when he saw me go to the bathroom, he declared that "Mom's a big boy too!" and afterwards he let me know that I "did a good job," and that I could "choose a treat." What a fun time of life! Anyone with any good suggestions on how to potty train is more than welcome to comment! The kids in their swimsuits! I apologize to everyone in Utah who is still miserable and cold and suffering the effects of a long, snowy winter :( You should move to Florida! Just a few random pics of the kids. Regrettably, I falied to get a good shot of Nana and Grandpa Kent with the kids while they were here....oops! Well, it's not actually our anniversary yet....it's really on April 24th, BUT....since Ben's parents came into town last Friday, we decided to celebrate early 'cause we had free babysitters!! So, we took off on Saturday to spend the day together (this time without the kids) at Disney World, and then on Sunday, we drove up to St. Augustine and spent the day sightseeing and the night in a really nice hotel. It was REALLY fun, and great (although we do love them!) to get away from the kids! St. Augustine is famous for being the nation's oldest city. It happened to be a little overcast and chilly while we were there, hence the hooded Jenny. Fortunately for us, Ben keeps one of his hoodies in the trunk of our car; otherwise, I would have been a LOT colder, and I HATE being cold! :) Enjoy the pics!